Reservations need to be made by 4/24/17 to receive discount. 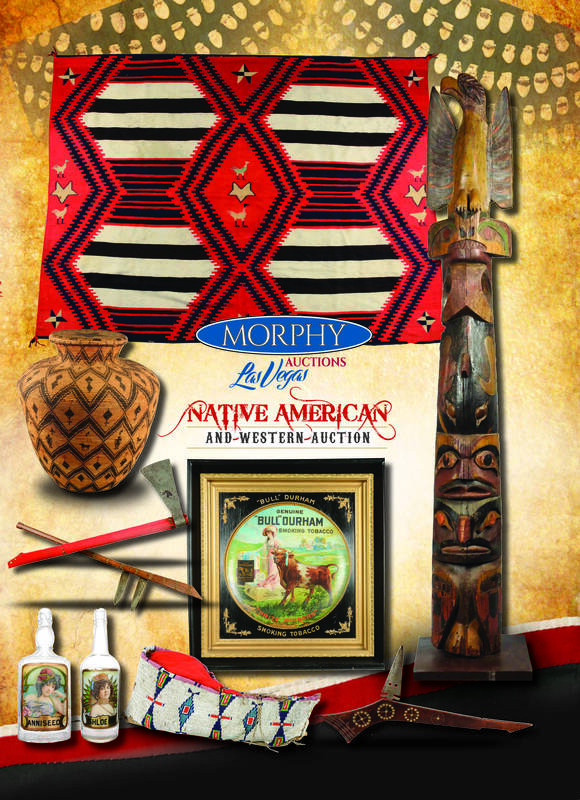 Morphy Auctions’ May, 2017 Native American and Western Sales Event to Feature a Remarkable Collection of Outstanding Indian and Historical Artifacts, Antique Advertising and Ephemera, Hand Weapons, and Early Back Bar Bottles. This auction presents over 260 “best of the west” lots, including a fine offering of original American Indian ceremonial, functional, and decorative items from the 19th and early 20th centuries. A full spectrum of quality merchandise will be offered across the most desirable collecting categories. All items in this sale are available for preview now in the company’s Las Vegas facility. American Indian cultural items feature prominently in this auction, with many of these handmade treasures and artifacts demonstrating extraordinary quality and design. Lot #67, a c. 1865-1875 rare third phase pictorial Chief’s blanket variant, is woven with natural ivory and brown wool, and is colored with indigo blue, red cochineal, and green vegetable dyes. Measuring 85” x 64”, its design features unusual pictorial elements including stars and birds. It is estimated at $60,000-90,000. Lot #111, a rare c. 1860 Prairie tobacco bag detailed with contour floral motifs beaded on hide, cut-outs, and early paint, should hold bidders interest with its $20,000-30,000 estimate. Lot #256, an early 20th century 124-1/2” high non-traditional native cedar totem pole features carved faces and is topped with an eagle with spread wings. It is estimated at $10,000-20,000 and includes a base to keep it securely upright. And lot #155, a c. late 19th century Western Apache large coiled and lidded basket, made from devil’s claw, red yucca, and willow fibers, is truly a work of art from every angle. This pictorial polychrome olla is decorated with woven stylized human and equine figures among chevrons; its lid has a large morning star center and small triangles around the rim. This stunning rarity is estimated at $40,000-80,000. Collectors are certain to go to war over this sale’s fantastic selections of interesting antique hand weapons. Lot #109, a beautifully made c. 1880 pipe tomahawk with a steel head, its original leather gasket, and an unusually long original haft with file branding is estimated at $10,000-15,000. Lot #110, a c. 1840-50 Osage Missouri War axe tomahawk features a long, round haft and triangular, thin blade, typical to its age and origins. This outstanding example was featured in the 2010 book The Missouri War Axe: War Tomahawk of the Plains and Prairies and is estimated at $15,000-20,000. Lot #157, a very rare c. 1860-1870 Yanktonai Sioux knife blade war club features two large blades and a haft made of chestnut that is decorated with hot file branding and brass tacks. There are approximately 20 known knife blade war clubs; all attributed to the Yanktonai Sioux of eastern South Dakota. This extraordinary this example was featured in the 2009 book The Mark Francis Collection of American Indian Art and is estimated at $15,000-25,000. And lot #66, a c. 1860 Eastern plains or Western Great Lakes classic gun stock club is estimated at $45,000-50,000. This rarity features a triangular base pierced for attachment of a wrist cord and a recessed grip. Its other cutting edge details include an elaborated engraved, carved, and accented shaft and an exaggerated steel blade – pierced twice and inlaid with brass the words “Little Hill” – set into the crook. This event features an extensive offering of antique advertising materials relating to America’s fascination with the “wild west.” Lot #146, a rare Old Forester Whiskey advertisement is estimated at $10,000-15,000. This printer’s proof with reverse lettering is professionally mounted and framed and was produced by Chas. W. Shonk Co. of Chicago. And lot #50, a c. 1908-09 poster for the Winchester .401 caliber self-loading rifle is right on target with its $4,000-5,000 estimate. This vibrant example was originally executed by Philip R. Goodwin for Winchester. Two outstanding Indian themed antique advertising examples are lot #100, a mid-19th century, 90” tall wooden cigar store Indian, estimated at $40,000-80,000 and lot #7, a c. 1885, 77” tall flat board cigar store Indian tobacco curb sign, estimated at $6,000-12,000. The full-bodied Indian is hand carved, holds a bundle of “Best Quality Cigars,” and is looking off into the distance with one hand shading his eyes. The flat board Indian sign was made for narrow doorways and easy storage and came from Baltimore. It is marked “E.H. carved” on the bend of the elbow. Similar early flat board cigar store signs are pictured and described in Cigar Store Figures in American Folk Art by A. W. Pendergast and W. Porter Ware and Artists in Wood by Frederick Fried. Exciting Buffalo Bill themed collectibles also take the spotlight in this sale. Cabinet cards, posters, and paintings featuring this famous showman are all on offer. Lot #99, an extremely rare Buffalo Bill’s Wild West White Eagle advertising poster, is estimated at $8,000-15,000. It is framed behind glass and is illustrated with Buffalo Bill “guiding and guarding;” its colors remain magnificent and vibrant. And lot #131, a matted and framed original show poster for Buffalo Bill’s Wild West. Congress, Rough Riders of the World. Miss Annie Oakley, The Peerless Lady Wing-Shot in very nice condition is estimated at $3,000-4,000. This full color example was printed by A. Hoen & Co. from Baltimore and measures 20” x 29”. This sale rounds out with a refreshing blend of antique back bar bottles, calendars, artwork, sculptures, and saddles. Lot #51, a framed Union Metallic Cartridge Co. 1900 single calendar page of plains buffalo is estimated at $10,000-15,000. Lot #185, a clear, faceted glass aniseed back bar bottle decorated with an image of a lovely woman is estimated at $2,000-4,000. And Joyce Lee’s original oil on board painting, Practice Loop, comes full circle at $5,000-8,000.